A new DVD review has been added to the site today! Matt West has taken a look at the Region 1 edition of the brand new made-for-DVD Futurama movie Bender's Big Score, which is released in the US tomorrow. Oddly, there's no sign of a UK release yet. Click on the sleeve image, right, or here to read Matt's review. Many new titles have been added to the Incoming database this week, including Paramount's underperforming fantasy Stardust, Aaron Sorkin's critically acclaimed drama series Studio 60 on the Sunset Strip, and the Platinum Edition of Disney's 101 Dalmatians. Don't forget that, in addition to the list of forthcoming titles, you can also search the database for titles that have are already available. Using our affiliate links helps keep Zeta Minor afloat! Titan Books will release an autobiography of cult icon Patrick Macnee, titled The Avengers - The Inside Story, on January the 25th. The 144-page hardback will apparently feature "many previously unpublished stills and behind-the-scenes photos, plus publicity and promotional material and even snaps from Macnee's private collection". 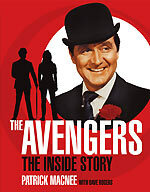 The book, which is co-written by Dave Rogers, is being touted as "the first official autobiography of Patrick Macnee and The Avengers", something that will no doubt come as something of a surprise to readers of Macnee's 1988 book Blind in One Ear - Autobiography of an Avenger, or, indeed, Dave Rogers and Macnee's 1997 tome The Avengers and Me. The book has an RRP of £17.99. Amazon.co.uk has it available for £11.24. Steed's full name is John Wickham Gascone Berresford Steed. The Avengers was a successor - though not a direct sequel - to the earlier series Police Surgeon, which starred Macnee’s original Avengers co-star, Ian Hendry. The original macho female spy, Cathy Gale (played by Honor Blackman), was based on a combination of Life magazine's daring photographer, Margaret Bourke-White, and anthropologist Margaret Mead. The Avengers was the first British TV programme to be sold to a US Network. The name of the character Emma Peel was derived from the verbal shorthand given to the character’s introduction as “man appeal” – M. Appeal. In 1998, The Avengers was given the Hollywood treatment as a blockbuster movie starring Ralph Fiennes as John Steed and Uma Thurman as Emma Peel. Patrick Macnee featured in voice as “Invisible Jones”. Production on the first season of The Avengers was cut short by an industry strike. The sustained popularity of the Tara King episodes in France led to a 1975 French television commercial for a brand of champagne, featuring both Thorson and Macnee reprising their roles.